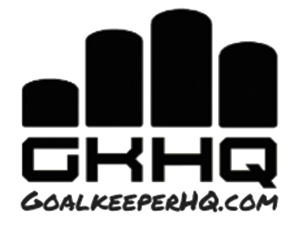 Goalkeepers should be aware there are two scenarios and methods of saving for penalties. Pre-penalty – Ensure the ball is kicked away by yourself or a teammate after the kick has been given. Plead ignorance if given a talking to by the referee, saying that you didn’t hear the whistle. By having the ball a long way away from the penalty taker, it delays the game thus providing extra time for the penalty taker to think about their kick and for you to get into their head. Assess the type of player taking the kick – Generally speaking, defenders take fewer risks than forwards and tend to play safe by pushing the ball to the same side as their kicking foot. Tricky, skillful players may try to fool the goalkeeper with a clip down the middle. Left-footed players tend to put the ball in the opposite corner. Watching the eyes of the kicker – If you can get the ball and hand it to the kicker. Watch them place the ball down. 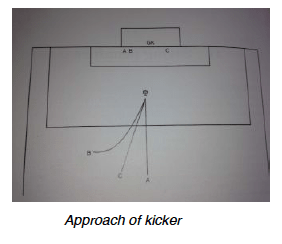 In many instances, the kicker looks to the side where they are going to kick. By being so far off your line, you are also getting a phycological advantage by covering so much of the goal until you are told to go back to your line. The above tips give the goalkeeper the best chance to anticipate where the ball is going to go and guess the save. As goalkeepers, we must remember that at Penalty shoot-outs, there will be players taking penalties that are not normal penalty takers. They will be nervous, play safe and easier to read. You can pretty much bet that two of the five penalties will be within a 5yd goal – thus leaving 1.5 yds either side of the goal that you won’t need to go for. With this technique, the goalkeeper can pretty much react to the shot, rather than anticipate. Two saves out of five will make you a hero! * Dummy the kicker – Make an exaggerated move to your weaker side as the kicker runs up, hoping that they put to your strong side or make them change their mind last minute. * Stand, off center of the goal – This messes with their head. If the kicker always kicks to the side that you have made smaller, they may think about changing…… but what if you have left the other side open because that is where you are going to dive? Get in their head! * Loud, large movements across the goal – Ensure you are set before saving though. This recent addition to the article is the delay in the extreme, by kicking the ball away as advised in the one-off penalty decision. The video below shows how the goalkeeper accepts a yellow card for gaining the advantage of delaying the kicker. Lastly, don’t celebrate too early!! There have been cases of the ball hitting a crossbar or even a goalkeeper’s save, and with the goalkeeper still celebrating at a victorious penalty shoot-out, the ball has spun into the goal.